Indian spiritual guru Sri Sri Ravi Shankar arrived in Argentina late Tuesday to spread the message of universal peace and educate people on giving up violence to lead a better life. About 100,000 people in 300 cities across the world, including over 20,000 in this picturesque city, will pray and mediate Sep 9 for universal peace, a spokesman for him told IANS here Wednesday. The founder of Art of Living Foundation will also take part in a number of programmes including yoga courses, breathing techniques, experimental exercises and discourses on improving the quality of life. 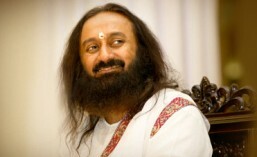 The mega event will be guided by Ravi Shankar. The main purpose of the event is to spread the benefits of positive vibrations of meditation,” the organizer said. In Argentina, the event will be held at the crossroads of Pampa and Figuero Alcort in downtown, with youngsters, grown-ups and children in hundreds joining the devout members of Art of Living. Headquartered in India’s tech hub Bangalore, the three-decades-old non-profit organization offers yoga courses for stress management and welfare measures for the common good of people. It has units in 151 countries. Our programmes help millions to overcome stress, depression and violent tendencies, the member said. The foundation also works on diverse humanitarian projects, including conflict resolution, relief in areas of natural disaster, sustainable development projects, empowerment of women and rehabilitation of people deprived of liberty.